The 21-member search committee for the new University of Iowa president will be heavily weighted with members from the campus community and also include two members of the public. President Sally Mason is retiring in August. 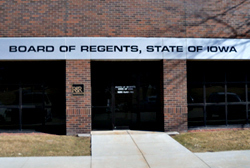 The Board of Regents will also use a search firm to find her replacement, and executive director Robert Donley told the board Thursday that today is the deadline for search firms to apply. He anticipates selecting a search firm by next Thursday, February 12th. There were two searches at the University of Iowa the last time they needed a new president, with the first ending without any of the finalists being chosen, and the second search ended with Mason being chosen amid complaints that the process did not include enough input from the campus community. Donley says anyone can submit a nomination for someone they believe should fill the public positions on the search committee. He says submit the information on the person to the board office. He says you should submit a brief summary with the name, contact information and a summary of 250 words or less on why they should be considered for the appointment. Nominations should be sent to: Marcia Brunson, Policy and Operations Officer, Board of Regents, by email at mbruns@iastate.edu. Other members of the committee will include: 3 members of the Board of Regents, representatives from the U-I foundation and alumni association, the dean of the U-I college of business, the president and president elect of the faculty senate and five members of the faculty appointed by the regents, the presidents of the U-I staff council, student government and graduate and professional student goverment. Donley says they will announce the final members of the committee by February 16th. Donley says the search process will follow the models used in the recent searches for new presidents at Iowa State University and the University of Northern Iowa.